Anything for pizzaaa! Hahaha! 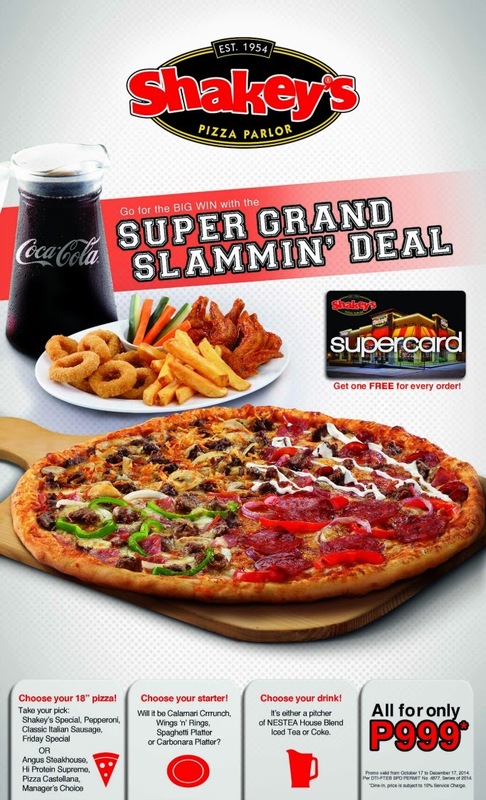 Here's an exciting deal from Shakey's for only P999... Avail it while it lasts! 1) Choose any of your favorite starters or pasta. This could be the seasoned and deep-fried Calamari Crrrunch or the tender and juicy Buffalo wings or the hot and crispy perfection of Wings’n’Rings. If you’re a pasta lover, perhaps try the deliciously creamy Carbonara Platter or the delightful Spaghetti Platter. 2) Select your 18-inch Grand Slam Pizza flavor combination. Original four delicious flavors: Shakey’s Special, Pepperoni, Classic Italian Sausage and Friday Special or New Combination flavors: Angus Steakhouse, Hi-Protein Supreme, Pizza Castellana and Managers Choice. 3) Finish off with a refreshing pitcher of your choice drink. The promo runs until December 17 only, so make sure you get your Shakey’s Super Grand Slammin’ Deal in any Shakey’s branch near you.